My mother was a beautiful dancer. Her dance partners always told her how light she was on her feet. It was the one activity she shared with her mother (my grandmother), and her sisters. They used to go dancing every weekend as a family, and loved it. Every party she threw, you could bet dancing was always on the agenda. As a child, I would listen to all the exciting sounds of the party and sneak out and peep at the grown-ups dancing, twirling on the dance floor in their beautiful dresses. Mountain Gate shopping centre is a place I frequent almost every fortnight, and as I walk the shopping strip, I pass Frockup Dancewear and I always stop at the window to look at the display and to peep into the shop from the doorway. I have never gone in, as unlike my mother, I'm born with two left feet and cannot dance to save my life, hence figured I had no reason to go in. I guess looking at these clothes touched on my memories of my mother who is no longer with me. This time however, I decided to go in and admire the vintage looking dresses that were calling to me like the sirens from the sea. I could not resist, and once in, I got talking to Kerrie the owner. Kerrie has been in business for seven years. She was inspired to go into dance wear when her daughter started dancing. She saw a niche in the market when she found most everyone was catering to the smaller sizes before, and there was nothing around for 'real women'. Her partners daughter who also danced was 6' tall and not a size 8. Thus began her journey of sourcing her own dresses in all shapes and sizes, that brought her to the business as it is now. She started by offering a range for hire, then opened the store where it stands today, a year ago. It's not just local customers, but ballroom and ballet dancers from all over Melbourne come to her as she offers a unique service by stocking various sizes. She gets a lot of local trade for her jazz, tap and ballet clothing, and a passing trade for her vintage clothing. 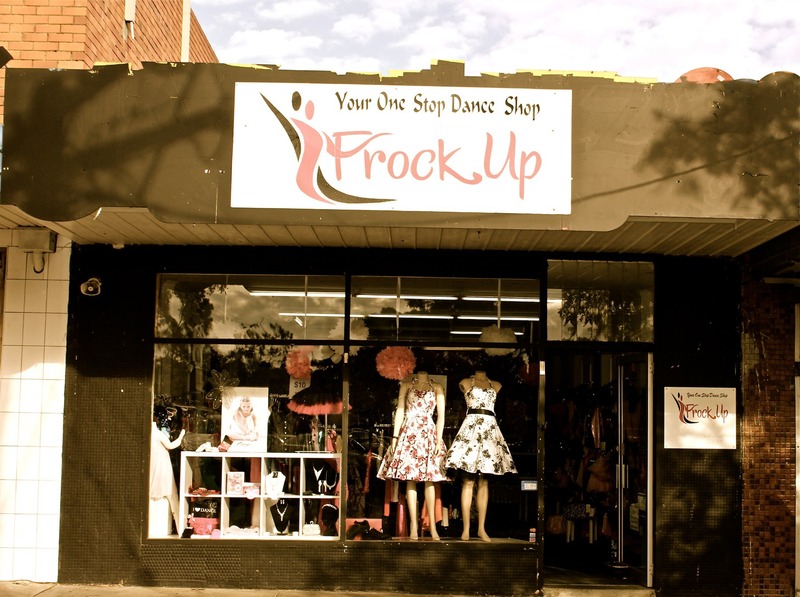 However, she has noticed that the vintage and rock and roll side of dance clothing is booming. Looks like vintage and rockabilly has come to town. I can see how easily these styles fit in as street wear, everyday wear, dance wear or for special occasions. Drop in and feast your eyes on the dresses. If you're like me with two left feet, you can still look great in those beautiful vintage dresses.